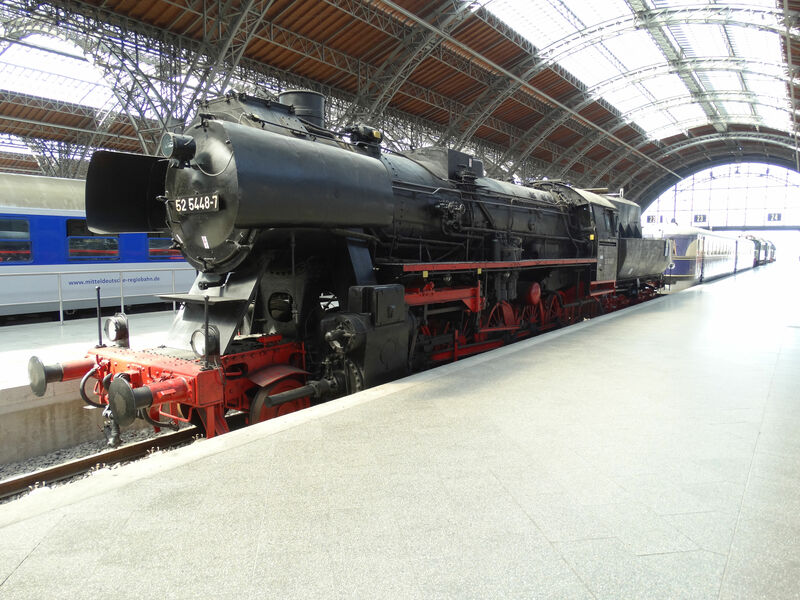 Germany is full of museum railroads and railroad museums and there are also numerous steam machines operating touristic trains. 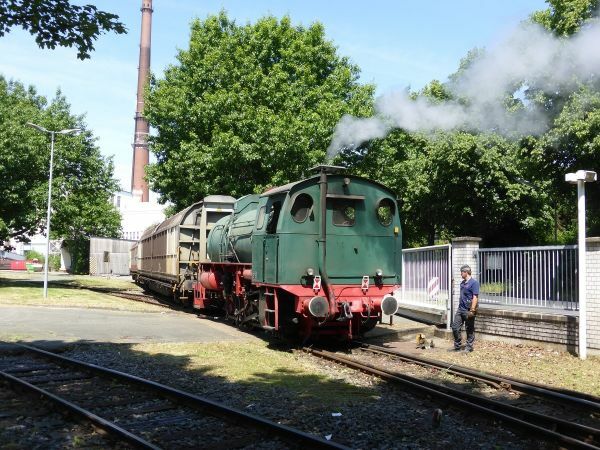 This one is a class 50 cargo steam engine from pre-WWII times, here owned by WTB and operating on the so called Sauschwänzlebahn (pig's tail railroad). Picture at Zollhaus Blumberg 18.7.2007 by Ilkka Siissalo. 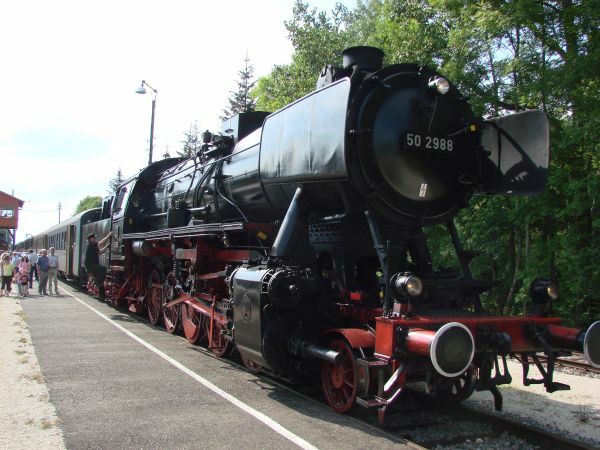 Another picture of the Sauschwänzlebahn Br 50 at Zollhaus Blumberg. Picture 18.7.2007 by Ilkka Siissalo. 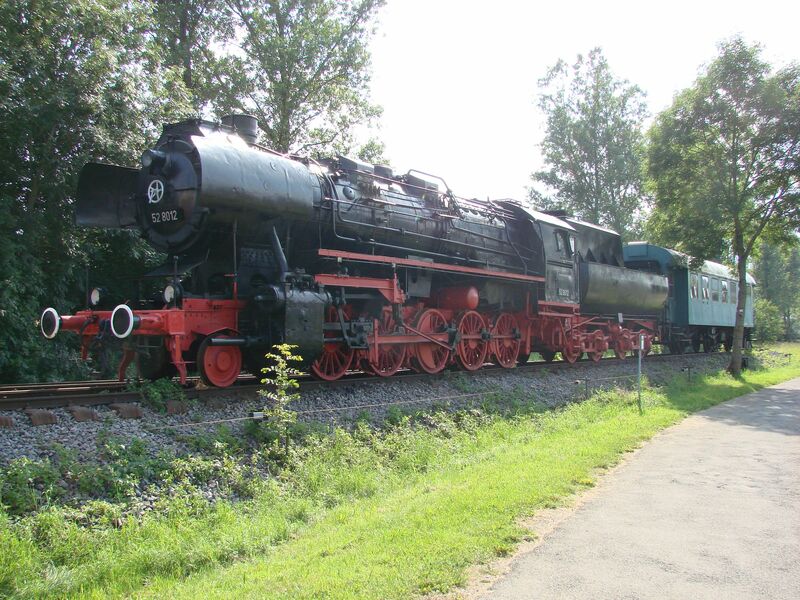 Same locomotive as above, moving it to the other end of the train. 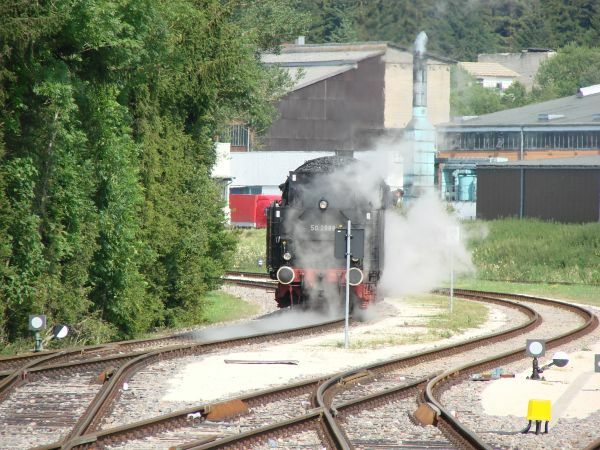 Sauschwänzlebahn Br 50 at Zollhaus Blumberg. Picture 18.7.2007 by Ilkka Siissalo. A German train just like they used to be in the 1950s: a Br 50 steam locomotive and so called Mitteleinstiegwagen coaches. Photo from Zollhaus Blumberg 18.7.2007 by Ilkka Siissalo. Still the same train as above. Photo from Zollhaus Blumberg 18.7.2007 by Ilkka Siissalo. This is the famous Br 52 Kriegslok or war locomotive of Hitler's Nazi Germany. 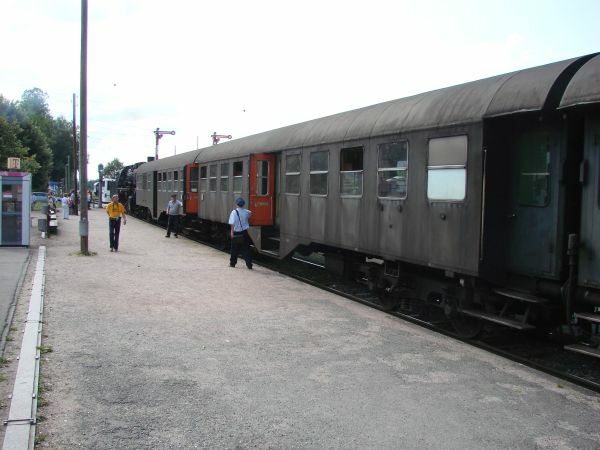 It was a simplified version of the Br 50 shown above. 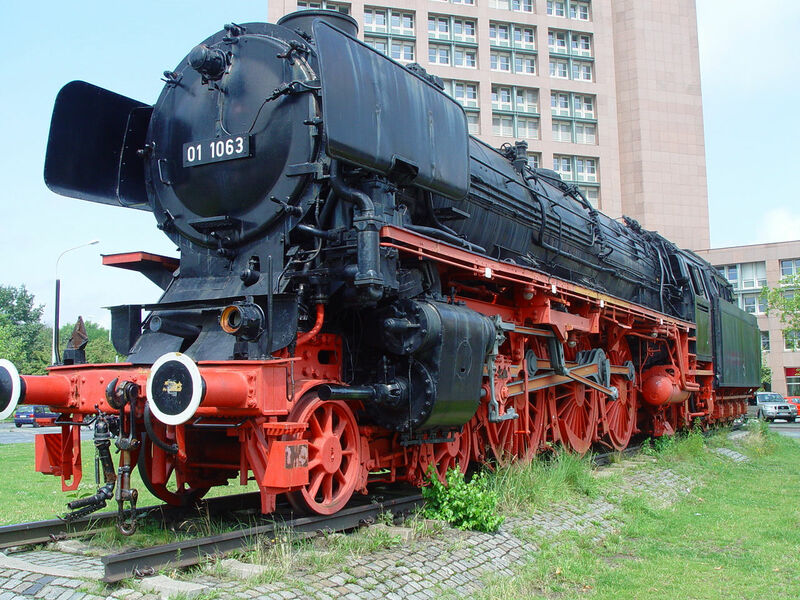 It was one of the most built steam locomotive types ever. It was built cheaply and fast and was intended to last in use only for 4-5 years, but tens of them have survived well over 60 years and while Hitler's army retreated, these locomotives were left behind everywhere from Soviet Union to Norway and France. The wagon behind the locomotive is one of the three axle Umbauwagen, or rebuilt coaches, which were made by building a new upper part on top of old cargo wagon undercarriages after the war. Another Br52 Kriegslok. This one is kept as a monument at the Leipzig main station. 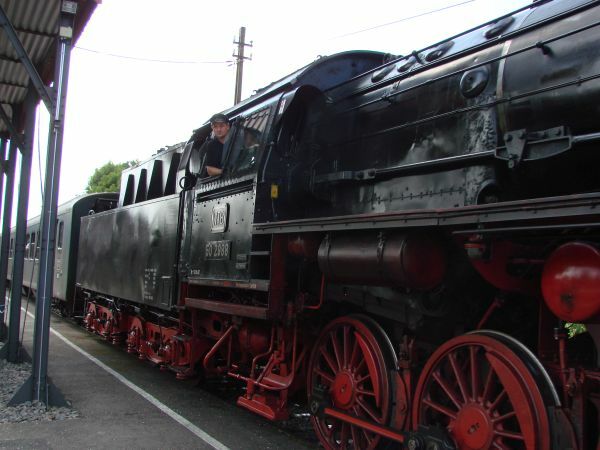 The class 01 was the biggest, fastest and most powerful of German express train steam engines (if we forget for a while some experimental machines). 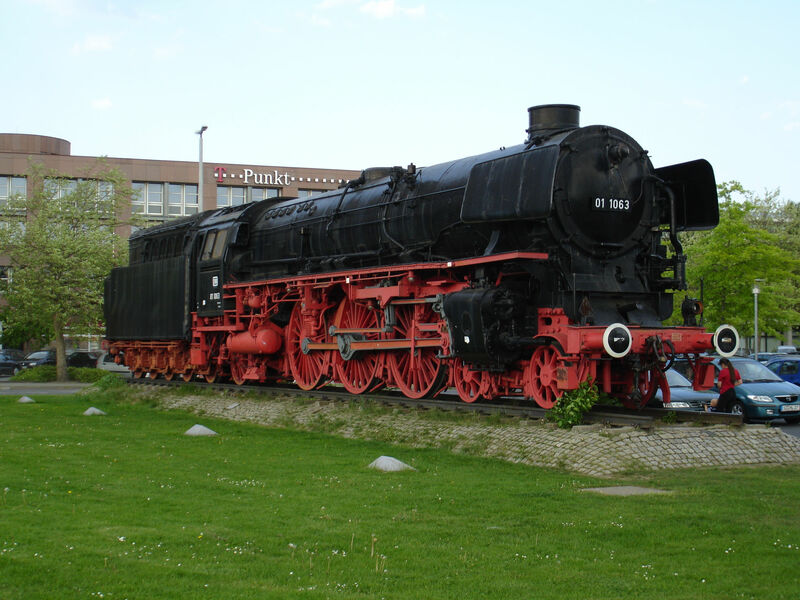 This one, 01 1063 has been set up as a monument in front of the main station of Braunschweig. Picture at Braunschweig Hauptbahnhof 12.5.2006 by Ilkka Siissalo. 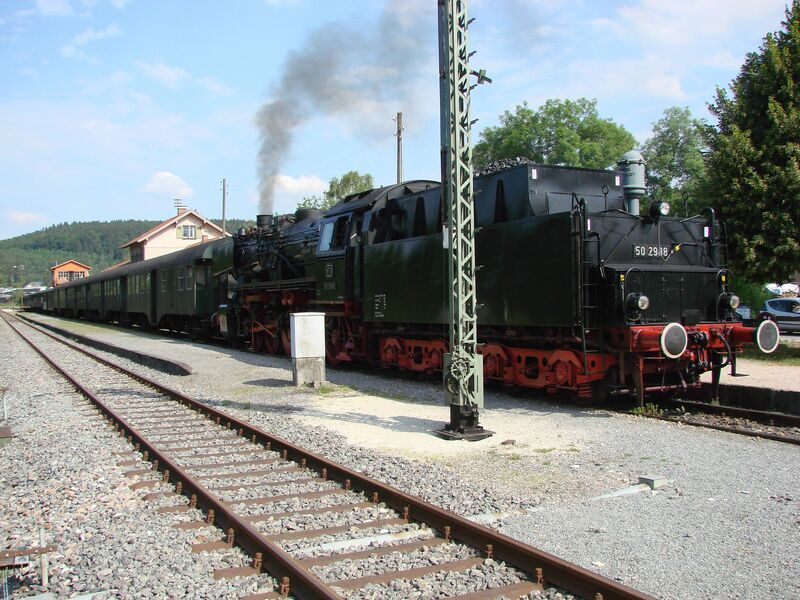 Another picture of the same class 01 as above. Picture at Braunschweig Hauptbahnhof 12.5.2006 by Ilkka Siissalo. 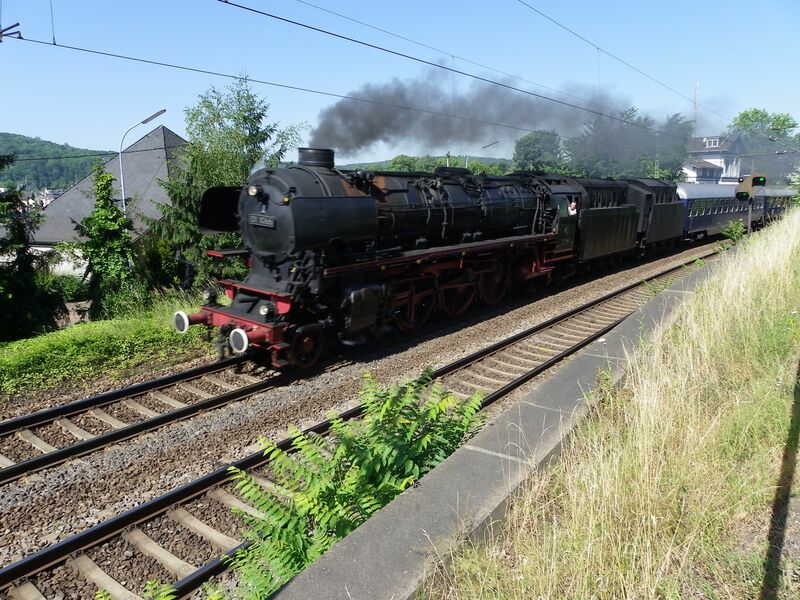 Express train steam locomotive 01 1066 owned by Ulmer Eisenbahnfreunde, railroad friends of Ulm, in full speed by Erpel 8.7.2010. Picture by Ilkka Siissalo. 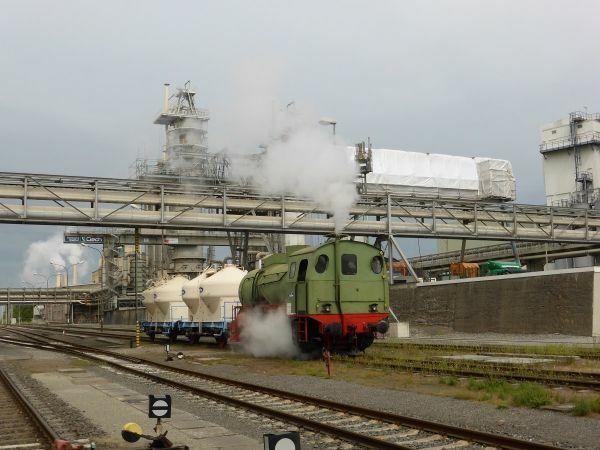 Many factories not only in Germany, but also elsewhere have commonly had tank locomotives which took their hot steam from a factory and did not have any fire at the locomotive itself. They were clean and cheap to operate, but could not reach very far from the factory itself. But for shunting at the factory area and hauling wagons to and from the nearest station they have been common. This fireless locomotive is protographed in Osnabrück still in full use in 2015. Picture by Robert Sand. Another fireless steam tank loco in use in Staßfurt in 2017. Picture by Robert Sand. 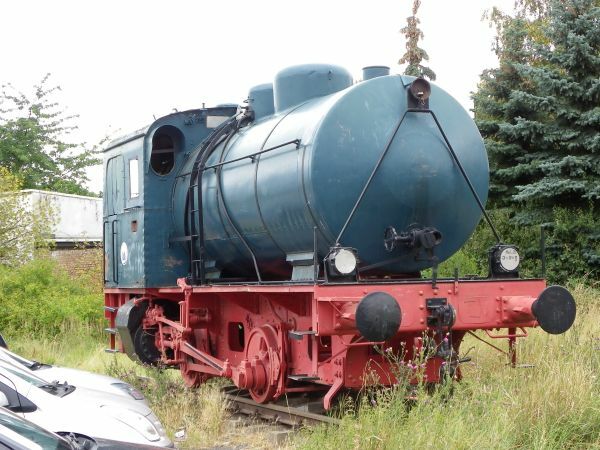 This fireless steam tank served for many years the sugar factory Pfeifer & Langen at Euskirchen before it was set up as a monument of the old times close to the Euskirchen station. Picture from Euskirchen 23.7.2011 by Ilkka Siissalo. This is the former East German counterpart of locomotives shown above, built by LEW Hennigsdorf close to Berlin during the communist times of DDR. This is very similar to the one shown from Staßfurt above. 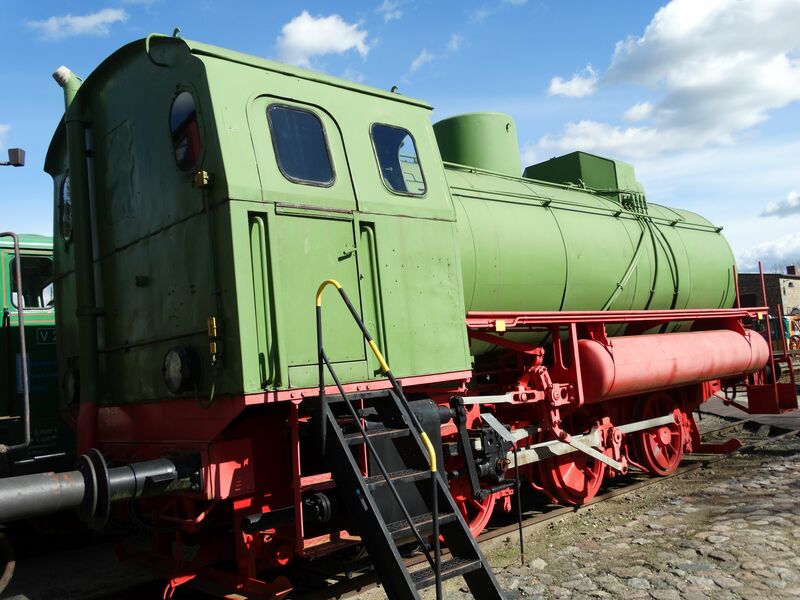 Picture from Eisenbahnmuseum Gramzow 6.4.2017 by Ilkka Siissalo.